For other uses, see Igloo (disambiguation). 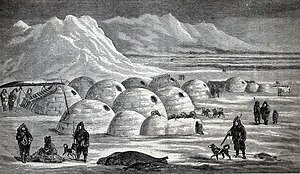 The Inuit language word iglu (plural igluit) can be used for a house or home built of any material, and is not restricted exclusively to snowhouses (called specifically igluvijaq, plural igluvijait), but includes traditional tents, sod houses, homes constructed of driftwood and modern buildings. Several dialects throughout the Canadian Arctic (Siglitun, Inuinnaqtun, Natsilingmiutut, Kivalliq, North Baffin) use iglu for all buildings, including snowhouses, and it is the term used by the Government of Nunavut. An exception to this is the dialect used in the Igloolik region. Iglu is used for other buildings, while igluvijaq, (plural igluvijait, Inuktitut syllabics: ᐃᒡᓗᕕᔭᖅ) is specifically used for a snowhouse. Outside Inuit culture, however, igloo refers exclusively to shelters constructed from blocks of compacted snow, generally in the form of a dome. There are three traditional types of igloos, all of different sizes and used for different purposes. The smallest were constructed as temporary shelters, usually only used for one or two nights so they were easy to be built. These were built and used during hunting trips, often on open sea ice. Snow igloos are not spherical, but are built in a shape more closely resembling a paraboloid. Using this shape, the stresses of snow as it ages and compresses are less likely to cause it to buckle because in an inverted paraboloid or catenoid the pressures are nearer to being exclusively compressive. is the unit weight of the snow, and α = arctan (4h/d). Since stress is a force per unit area, if the walls are of uniform thickness the compressive stress is independent of wall thickness; thicker walls provide better insulation but do not strengthen the structure because of added weight. The maximum compressive stress at the base of the igloo can be obtained by multiplying S,/yd times the snow unit weight y and the mean igloo base diameter. 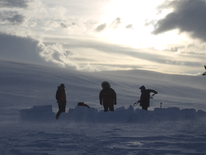 Igloos gradually become shorter with time due to the compressive creep of the snow. The snow used to build an igloo must have enough structural strength to be cut and stacked appropriately. The best snow to use for this purpose is snow which has been blown by wind, which can serve to compact and interlock the ice crystals. The hole left in the snow where the blocks are cut is usually used as the lower half of the shelter. Sometimes, a short tunnel is constructed at the entrance to reduce wind and heat loss when the door is opened. Snow's effective insulating properties enable the inside of the igloo to remain relatively warm. 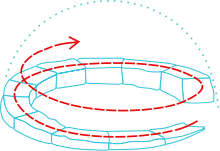 In some cases, a single block of clear ice is inserted to allow light into the igloo. Animal skins were used as door flaps to keep warm air in. Igloos used as winter shelters had beds made of ice and caribou furs. These 'ice beds' are unique to the region and Inuit culture. Architecturally, the igloo is unique in that it is a dome that can be raised out of independent blocks leaning on each other and polished to fit without an additional supporting structure during construction. An igloo that is built correctly will support the weight of a person standing on the roof. In the traditional Inuit igloo, the heat from the kudlik (qulliq, stone lamp) causes the interior to melt slightly. This melting and refreezing builds up a layer of ice that contributes to the strength of the igloo. The sleeping platform is a raised area. Because warmer air rises and cooler air settles, the entrance area acts as a cold trap whereas the sleeping area will hold whatever heat is generated by a stove, lamp, body heat, or other device. The Central Inuit, especially those around the Davis Strait, lined the living area with skin, which could increase the temperature within from around 2 °C (36 °F) to 10–20 °C (50–68 °F). ^ a b c "Iglu". Asuilaak Living Dictionary. Retrieved 2011-07-19. ^ Steckley, John L. (2008). White lies about the Inuit. Peterborough, Ont. : Broadview Press. p. 19. ISBN 1551118750. ^ "How Warm is an Igloo?, BEE453 Spring 2003 (PDF)" (PDF). Archived (PDF) from the original on 2012-04-17. Retrieved 2012-07-10. ^ "The Mackenzie Inuit Winter House" (PDF). Archived (PDF) from the original on 2012-04-01. Retrieved 2012-07-10. ^ "Reconstructing traditional Inuit house forms using three-dimensional interactive computer modelling" (PDF). Archived (PDF) from the original on 2009-03-26. Retrieved 2012-07-10. ^ "About the Flag and Coat of Arms". Gov.nu.ca. 1999-04-01. Archived from the original on 2013-03-07. Retrieved 2012-07-10. ^ Inuinnaqtun English Dictionary. Cambridge Bay, Nunavut: Nunavut Arctic College, 1996. ^ "Igluvijaq". Asuilaak Living Dictionary. Retrieved 2011-06-29. ^ a b Handy, Richard L. (Dec 1973). "The Igloo and the Natural Bridge as Ultimate Structures" (PDF). Arctic. Arctic Institute of North America. 26 (4): 276–277. doi:10.14430/arctic2926. Archived (PDF) from the original on 2016-03-04. ^ Fischer, Ladislav (1968). "Theory and practice of shell structures". Berlin, Ernst & Sohn: 541. OCLC 459828. Archived from the original on 5 March 2016. Retrieved 1 August 2015. ^ Jumikis, Alfreds R (1966). Thermal Soil Mechanics. Rutgers University Press. p. 56. ISBN 9780813505244. OCLC 562325. Retrieved 1 August 2015. ^ "What house-builders can learn from igloos, 2008, Dan Cruickshank, BBC". BBC News. 2008-04-02. Archived from the original on 2009-03-11. Retrieved 2012-07-10. Wikimedia Commons has media related to Igloo. Look up igloo in Wiktionary, the free dictionary.